We don't quite get this. 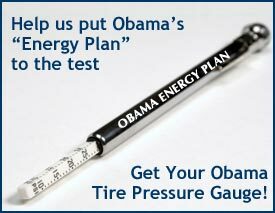 If you go to JohnMcCain.com you can order a tire pressure guage that is inscribed "Obama Energy Plan" for $25. We understand that John McCain spent last week trying to mock the suggestion of checking your tire pressure that Barack Obama made to one of his supporters at a campaign event. So he's mocking Obama by asking all of his supporters to buy a tire pressure gauge. A tire pressure gauge with Obama's name on it. Touting Obama's Energy Plan. You know, for $25 you can buy 6 gallons of gas.